Users might notice new ads pop up on their smartphones' Facebook News Feed as the social network has opened up its latest strategy to make money through its mobile app. In August, Facebook began testing a new "mobile app install ads" program that wasn't connected to users' social ties. The test was apparently a success as Facebook announced Wednesday via its developer blog that it's opening the service up to all developers. The test program allows an undisclosed amount of third-party developers purchase ad space on the mobile News Feed to help drive buyers to their apps. Those advertisements then lead users to the developer's app store purchase page either through the Android or Apple app store. "For years, many apps and games on Facebook.com have used ads as an important part of their growth strategy," Facebook's Vijaye Raji wrote on Facebook's developer's blog. "Now we are bringing these opportunities to mobile apps," Raji continued. "With these new ads, mobile apps and games of all sizes across any category can reach the right audience, at scale." In the post, Raji touted the new program's ability to help developers reach more relevant audiences and drive up install rates. He pointed to game creator TinyCo, which saw a 50 percent higher click-through rate when it participated. Other advertisers reached 8-10 times the audience and Ad Parlor clients saw consistent 1-2 percent increases in click-through rate from the home feed, according to Facebook. This is a bit of a break from the Facebook ad norm. Traditionally, ads pop up on users' pages because they or a friend liked the brand. But with this program, dev advertisers will be able to target the audience they want to sell to, instead of who likes them. 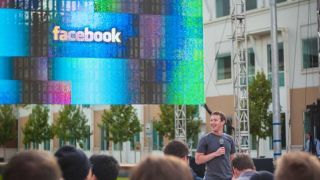 Facebook is banking on the hope that those two groups will have a large cross-section. Since the ad program is new, Facebook will still need to work out a few kinks to smooth out the user experience. The company will also improve the program's ad targeting abilities, as well as make sure developer ads aren't targeting users on the wrong platform. The program comes as Facebook tries to monetize its mobile space. The social network as a whole has felt the pressure to become more profitable after its failed IPO in May. In September, the stock hit a new low at $17.55 (UK£11.14, AU$17.33) from its starting price of $38 (UK£23, AU$36). We'll see if the new mobile app install ad program wows investors next Tuesday, when Facebook calls to share its third-quarter earnings.